Artists' prints are hand-crafted in traditional media, and produced in limited, numbered editions printed by hand on high quality, durable papers. Collectors find them an affordable way to have an original work by an artist they like, and some artists find that focussing on the challenges of printmaking techniques brings out the best in their work. Traditionally images for mass printing such as in books were skillfully created from hand-carved wood blocks or from hand-carved wood engravings, the latter offering finer detail which was much used in nineteenth century newspapers. Engraved steel plates were used to create black and white mini versions of famous artworks to be circulated and studied in the days before photography. Intaglio printing, from the Italian for "cut in", involves cutting into a surface to create grooves which hold ink, which is how etching plates work once acid has eaten grooves into the metal in the right places. 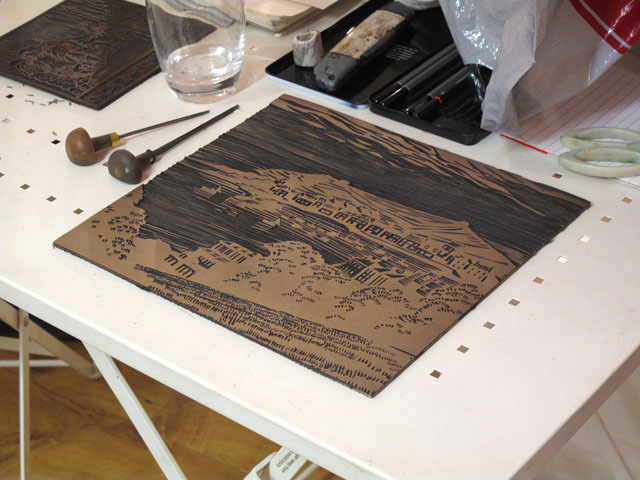 Relief printing is the opposite: raised surfaces receive the ink, such as with a linocut or a classic child's print done by inking up the flat surface of a potato that has had bits cut out. Lee's prints are available to buy unframed only. All prices include postage and packaging to UK destinations.